ClubCoins Tarvita: 116 Please note that, for now, you cannot download content from our platform directly onto a mobile device (phone, iPod, iPad, tablets...). You need to download your items onto a PC or Mac, and then transfer them onto your device in the normal way. We are working on allowing direct downloads to mobile devices but this is not possible in the current version of the platform. Sorry about the inconvenience! 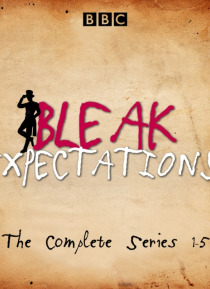 The complete collected series 1-5 of the gloriously daft Victorian Romp, Bleak Expectations.Gasp at the evil Mr Gently Benevolent, played by Mr Anthony Head! Weep at the trials of our young hero Pip Bin, played by Master Tom Allen! Be moved to joy and sorrow by the remarkable narration of Mr Richard Johnson! Swoon at the fragile beauty of Pip's poor Mama, played by Miss Celia Imrie! Wonder at the … thespian prowess of Mr Geoffrey Whitehead as six different siblings! Follow the remarkable adventures of young Pip Bin as he struggles to rescue himself and his sisters from the schemes of his evil and badly-named guardian Mr Gently Benevolent, and the blood-curdling Hardthrasher family. Immerse yourself in a timeless epic featuring terrifying schools, even worse prisons, opium dens, disguises, court-cases, shipwrecks, underwater squirrels and swash-buckling long-lost aunts. Revel in the many fine quips, characters and scenarios written by Mr. Mark Evans and produced by Mr. Gareth Edwards, previously renowned for their craftsmanship on the works of Messrs. Mitchell and Webb. Series 1: Televised as 'The Bleak Old Shop of Stuff' on the BBC. Episodes: A Childhood Cruelly Kippered, An Adolescence Utterly Trashed, A Youth Utterly Crocked, A Young Adult Bitterly Dismantled, A Young Love Mercilessly Dismembered, A Life Sadly Smashed then happily restored A Bit. Series 2: A Happy Life Cruelly Re-Kippered, A Re-kippered Life Smashed Some More, A Recovery Made Miserable, A Restoration Re-Ruined Only Even Worse, An Already Bed Life Made Worse But Sort of on Purpose, A Happy Life Broken and then Mended A Bit. Series 3: A Lovely Life Re-Kippered Again Once More, A Now Grim Life Yet More Grimmified, A Sort of Fine Life De-niced Completely, A Horrible Life Un-ruined and then Re-ruined Again, An Evil Life Sort of Explined, Lives Lost, Ruined Wrecked and Redeemed.Series 4: A Tolerable Life De-Happified, A New-Spoiled Life Smashed Some More, A Wretched Life Made Much Much Sadder, A Painful Life Re-Miserablised, A Now Tricky Life Woefully Miseried Up, A Life Destroyed then Repaired and Re-Happied. Series 5: A Pleasant Yet Dull Life Re-Evilled, A Re-Excited Life Made Distinctly Dangerous, An Alrightish Life Savagely Frozen to Bits, A Writerly Life Made Dreadfully Different, A Terrifying Life Made Even Scarier a Bit Some More, A Loved-Up Life Potentially Totally Annihilated. © 2009 - 2019 TFC International Ltd. All Rights Reserved.